Bjørnstjerne Martinius Bjørnson (Norwegian pronunciation: [ˈbjøːɳˈstjæːɳə ˈbjøːɳˈsɔn]; 8 December 1832 – 26 April 1910) was a Norwegian writer who received the 1903 Nobel Prize in Literature "as a tribute to his noble, magnificent and versatile poetry, which has always been distinguished by both the freshness of its inspiration and the rare purity of its spirit", becoming the first Norwegian Nobel laureate. 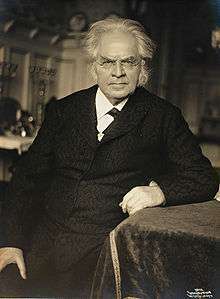 Bjørnson is considered to be one of The Four Greats (De Fire Store) among Norwegian writers, the others being Henrik Ibsen, Jonas Lie, and Alexander Kielland. Bjørnson is also celebrated for his lyrics to the Norwegian National Anthem, "Ja, vi elsker dette landet". Bjørnson was born at the farmstead of Bjørgan in Kvikne, a secluded village in the Østerdalen district, some sixty miles south of Trondheim. In 1837 Bjørnson's father Peder Bjørnson, who was the pastor of Kvikne, was transferred to the parish of Nesset, outside Molde in Romsdal. It was in this scenic district that Bjørnson spent his childhood. A subject which interested him greatly was the question of the bondemaal, the adopting of a national language for Norway distinct from the dansk-norsk (Dano-Norwegian), in which most Norwegian literature had hitherto been written. 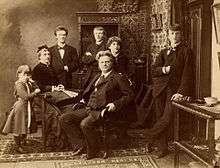 At an early stage, before 1860, Bjørnson had himself experimented with at least one short story written in landsmål. The interest, however, did not last, and he soon abandoned this enterprise altogether. Afterwards, he regretted that he never felt he gained the mastery of this language. 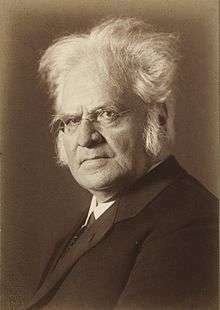 Bjørnson's strong and sometimes rather narrow patriotism did not blind him to what he considered the fatal folly of such a proposal, and his lectures and pamphlets against the målstræv in its extreme form were very effective. His attitude towards this must have changed sometime after 1881, as he still spoke on behalf of the farmers at this point. Although he seems to have been supportive of Ivar Aasen and friendly towards farmers (in the peasant-novels), he later denounced this, and stated in 1899 that there was limits to a farmer's cultivation. I can draw a line on the wall. The farmer can cultivate himself to this level, and no more, he wrote in 1899. Rumour has it that he had been insulted by a farmer at some point, and uttered the statement in sheer anger. In 1881, he spoke of the farmer's clothing borne by Henrik Wergeland, and his opinion then states that this garment, worn by Wergeland, was "of the most influential things" in the initiation of the national day. Bjørnson's attitude towards the farmers remain ambiguous. One has to remember that his father himself was a farmer's son. During the last twenty years of his life he wrote hundreds of articles in major European papers. He attacked the French justice in the Dreyfus Affair, and he fought for the rights of children in Slovakia to learn their own mother tongue. "To detach children from their mother tongue is identical to tearing them away from their mothers breasts," he wrote. Bjørnson wrote in multiple newspapers about the Černová massacre under the title The greatest industry of Hungary – which was supposedly 'to produce Magyars'. 1 2 3 4 Grøndahl, Carl Henrik; Tjomsland, Nina (1978). The Literary masters of Norway: with samples of their works. Tanum-Norli. ISBN 978-82-518-0727-2. 1 2 3 4 Beyer, Edvard & Moi, Bernt Morten (2007). "Bjørnstjerne Martinius Bjørnson". Store norske leksikon (in Norwegian). Oslo: Kunnskapsforlaget. Retrieved 9 September 2009. 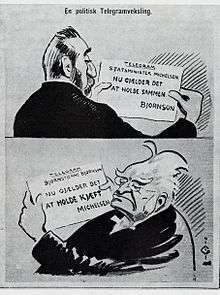 ↑ "Bjørnstjerne Bjørnson – The Nobel Prize in Literature 1903". The Nobel Foundation (From Nobel Lectures, Literature 1901–1967, Editor Horst Frenz, Elsevier Publishing Company, Amsterdam, 1969. This autobiography/biography was written at the time of the award and first published in the book series Les Prix Nobel. It was later edited and republished in Nobel Lectures.). 1903. Retrieved 6 September 2009. 1 2 Björnstjerne Björnson at Project Gutenberg. A biographical essay, 1910, by William Morton Payne, a translator of various works by Bjørnson. ↑ Nobel Foundation. "The Norwegian Nobel Committee Since 1901". Retrieved 14 October 2009. ↑ "Om Aulestad" (Norwegian). maihaugen.no. Retrieved 9 September 2009. This article incorporates text from a publication now in the public domain: Chisholm, Hugh, ed. (1911). "Björnson, Björnstjerne". Encyclopædia Britannica. 4 (11th ed.). Cambridge University Press. p. 17.